"The gutters your crew installed looks great and it was a delight to watch leaves slide off vs. the leaves clogging the gutters this year. We were gladdened by your commitment to find a solution to fix the problem. Thank you for taking care of our gutters." "Mr. Reyes, the owner of Reyes Roofing Contractors, has become our go-to option when we have any work that needs to be done to the exterior of our home. He has replaced the siding, shutters, gutters, roof and trim on two houses for us and also has arranged to have our deck repaired, power-washed and stained. Now he is doing some repair work on our brick chimney and some downspouts. We have total confidence that we are getting a fair price and high quality work. We especially appreciate that he personally found a craftsman to repair a large copper weathervane that was of great sentimental value to my mom. Because we feel good about the professionalism and courtesy of Mr. Reyes and his work teams, we have recommended him to several neighbors, all of whom also have opted to use his company. You will not find a more personable person to handle your outdoor housing maintenance issues." "We were delighted to find that Reyes Roofing's work in replacing our roof, siding, gutters and downspouts was not only excellent, but that we could rely on Reyes managers to solve every problem we encountered. Stained or damaged wood was replaced or restored better than new. When a garden shed required an undersurface for cement siding, the shed was effectively rebuilt with new materials. When a dryer vent was displaced during the installation of siding, Reyes employees helped us rebuild the venting system better than the original. The new copper roof on our bay window is a work of art. We are very grateful to the builder who recommended the Reyes family company to us. We could not have asked for more diligent workmen or finer craftsmen. 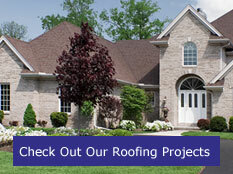 Reyes Roofing has provided us with what feels and looks like a new house." "After a hail storm, our insurance agreed to replace our home's roof, gutters and downspouts. Reyes Roofing's quote was right in line with what our insurance estimate. One of the problems our original roof had was poor attic venting, Mr. Reyes knew how to correct this problem and suggested the proper roof vent system for our house. We are very happy with our new roof and vent system, and would highly recommend Reyes Roofing for your roofing needs." Alexandria VA, Annandale VA, Arlington VA, Ashburn VA, Burke VA, Centreville VA, Chantilly VA, Clifton VA, Fairfax VA, Fairfax Station VA, Falls Church VA, Great Falls VA, Herndon VA, Leesburg VA, McLean VA, Oakton VA, Reston VA, Springfield VA, Sterling VA, and Vienna VA.